The Ranthambhore Bagh opened in 1998 as a modest 12-room hotel for travelers looking out for an experience in the Ranthambhore National Park. The following year we added luxury tents, with all the facilities that a modern day traveler needs. We have now evolved to a resort which caters to all kind of specialist needs and have become the favorite hangout of filming crews, photographers, naturalists, birders and tourists who desire a richer wildlife experience. If you are the kind who wants to photograph the Indian courser or identify the different individual tigers of Ranthambore then you have reached the right place. 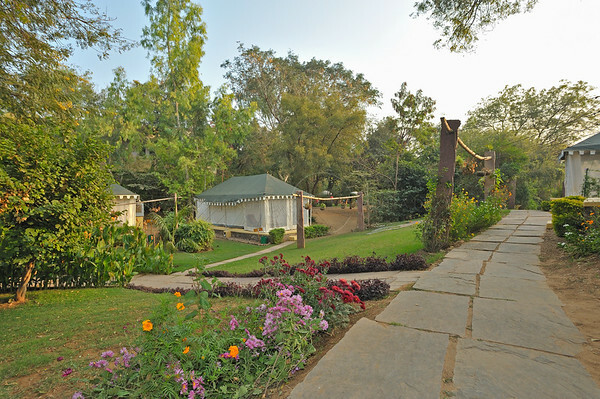 The outdoor area in The Ranthambhore Bagh consists of three beautifully landscaped gardens with many full-grown trees, which is not a common sight in most of the hotels of Ranthambore. The tents have been pitched on large rolling, tree covered grounds. Our checklist of birds that can be seen inside the campus, mainly around the tents, has gone up to 150 and we are still counting. "Ranthambhore is paradise for me. I like seeing the tigers. The pickles were very tasty. Thank you Poonam aunty and Aditya uncle!" Shibani Dayal (8 1/2 yrs), Sakshi Dayal (10 1/2 yrs), Srishti Dayal (12 yrs) & the Dayal family.